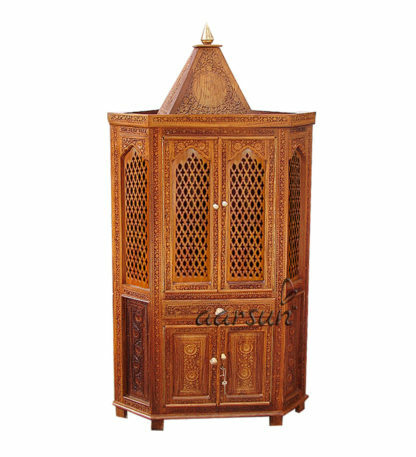 The temple is beautifully crafted by our skilled artisans in premium quality Sheesham wood with fine finish. The unit is mounted on square piers and above that there are two cabinets at the base of the temple for some puja essentials like rosewater,incense sticks,matchsticks, holy books etc.Above that there is main place for the deity in a closed set where you can give some personal space to your deity. At the roof top there is single dome placed in which beautiful carving done by our artisans.